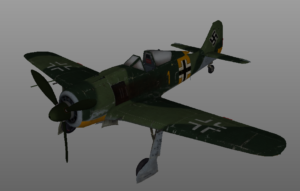 The Fw 190 Würger (English: Shrike) is a German single-seat, single-engine fighter aircraft designed by Kurt Tank in the late 1930s and widely used during World War II. 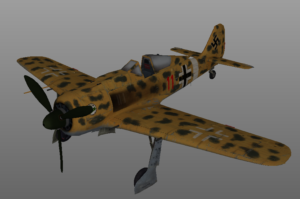 Along with its well-known counterpart, the Messerschmitt Bf 109, the Focke-Wulf 190 Würger became the backbone of the Luftwaffe’s Jagdwaffe (Fighter Force). The twin-row BMW 801 radial engine that powered most operational versions enabled the Fw 190 to lift larger loads than the Bf 109, allowing its use as a day fighter, fighter-bomber, ground-attack aircraft and, to a lesser degree, night fighter. 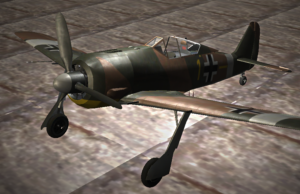 The Fw 190A started flying operationally over France in August 1941, and quickly proved superior in all but turn radius to the Royal Air Force’s main front-line fighter, the Spitfire Mk. V, especially at low and medium altitudes. The 190 maintained superiority over Allied fighters until the introduction of the improved Spitfire Mk. IX. 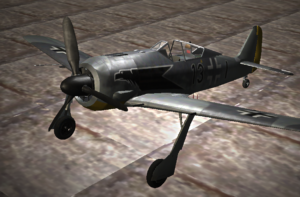 In November/December 1942, the Fw 190 made its air combat debut on the Eastern Front, finding much success in fighter wings and specialised ground attack units called Schlachtgeschwader (Battle Wings or Strike Wings) from October 1943 onwards. 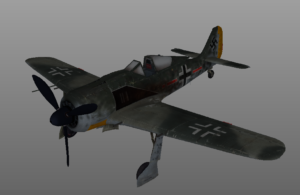 The Fw 190 provided greater firepower than the Bf 109, and at low to medium altitude, superior manoeuvrability, in the opinion of German pilots who flew both fighters.